Stringing Fool: History Blog Hop - Reveal Day! 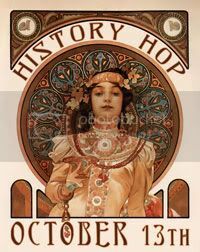 History Blog Hop - Reveal Day! So here it is, History Blog Hop Reveal day. Leah Curtis, of Beady Eyed Bunny set up this wonderful challenge. Pick a historical period and create jewelry inspired by the period. She even encouraged us to choose two periods! Being especially fond of the design possibilities of both Ancient Egypt and the 1920s to 30s Art Deco period, I went ahead and signed up for both! Yeah me! I even ordered supplies nice and early. Then, life stepped in and gave my husband a heart problem that could not be ignored (see my blog post of October 2 about that. I was able to finish the Egyptian pieces I had started, but the Art Deco eludes me to this moment. Fortunately, Hubby is home and things are well, but my work area is a bit disrupted. And.... I let my daughter borrow my camera without taking pictures of Ancient Egypt! So here are the pictures I have already posted once, and a promise to post more as soon as I can! 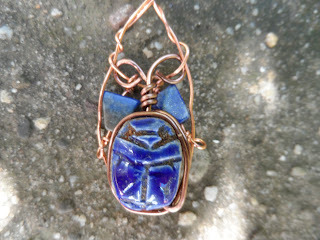 I created this pendant with Lapis Lazuli beads, copper wire, and a ceramic scarab bead I have had for a while. 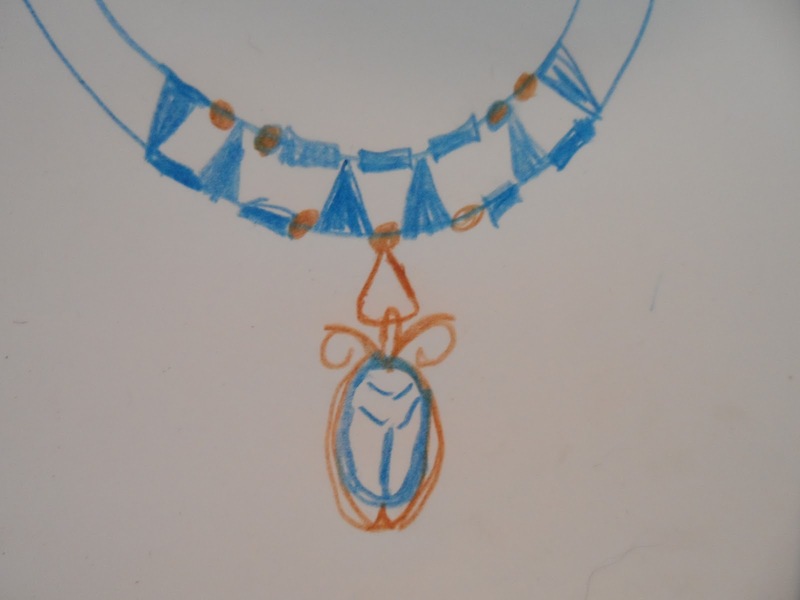 The necklace started out with a sketch. After playing a bit, I came up with something similar, that I will post when I get my camera back. It does not encircle the neck as an Egyptian piece would, but hangs from a chain giving it some modern wearablity. Earrings complete the set. Don't you love the blue lapis with the copper? As for the Art Deco piece, I can tell you that it will feature this focal. 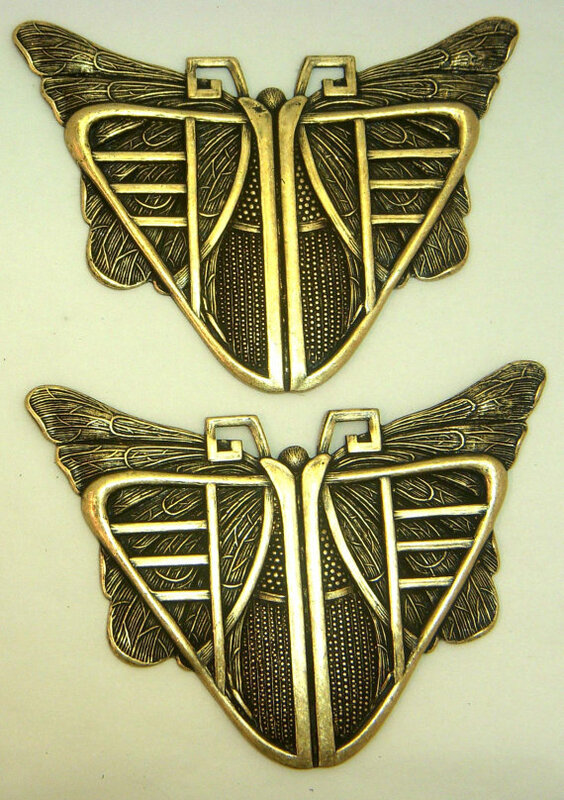 I liked the idea of using insects in both pieces, and the angular Art Deco or Arts and Crafts Style of the brass stamping. I purchased two from B'Sue's Etsy shop, but will only use one for this project. Be sure to visit Leah's blog and see what she has created. Then, visit the other participants! Watch This Space, for more Ancient Egyptian and Art Deco goodies! love what you did with the scarab! Oh, you're teasing us :) Looking forward to seeing the finalized pieces - judging by the sketch they will be goregous. I love the mix Lapis and copper, beautiful. I think the final will be gorgeous. I wish speedy recovery to your husband. Hope all will be well with your husband's health, Beti. I am certain your pieces will be lovely once you have a chance to relax and work with them again. Everything in its time! Looking forward to seeing the finished scarab necklace, but first things first. Take Care. I love your pendant. I can't wait to see the finished necklace. I hope everyone in your family is doing well. Love the pendant! Very Egyptian and beautiful. Thank you for joining in! I do adore that lapis glaze on the scarab with copper! I hope things are settling into recovery mode at home. Wishing you and your husband all the best. And keep us posted on that Deco focal! You picked a perfect combo as there were many Egyptian inspired Deco designs. Beautiful scarab! I look forward to seeing what you make once life settles back down for you!